Auroras for Father's Day? It could happen. Sign him up for SpaceWeather PHONE. HERE COMES THE SUN: On June 12th at 0230 UT, magnetic fields near sunspot 775 erupted. The explosion sparked a C4-class solar flare and hurled a coronal mass ejection into space: movie. The CME is not heading directly toward Earth, but it could deliver a glancing blow to our planet's magnetic field on June 14th or 15th. High-latitude sky watchers should be alert for auroras when the cloud arrives. BIG SUNSPOTS: Two big active regions are transiting the sun today: sunspots 775 and 776. Both have unstable magnetic fields that harbor energy for M-class eruptions. "These sunspots are very large, very impressive!" says Wah! of Hong Kong who took the above picture of active region 776 on June 11th. The 'spot stretches approximately 10 Earth-diameters from end to end. 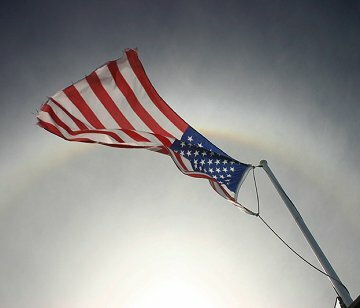 SUN HALO AND OLD GLORY: "This beautiful sun halo was easily visible [yesterday] at about 11:00 a.m.," says Gary Pittman of Marion, Kansas. Sun halos are a reminder that no matter how hot it gets on the ground, there's a cooler place above your head ... about 10 km high. At that altitude, tiny ice crystals float in freezing cirrus clouds. The crystals intercept and bend sunlight into eye-catching halos. Keep looking up! SOMETHING NEW: Going to the Moon? Be careful. A new kind of solar storm can take you by surprise. Get the full story from Science@NASA. Potentially Hazardous Asteroids (PHAs) are space rocks larger than approximately 100m that can come closer to Earth than 0.05 AU. None of the known PHAs are on a collision course with our planet, although astronomers are finding new ones all the time. Atmospheric Optics -- the first place to look for information about sundogs, pillars, rainbows and related phenomena. See also Snow Crystals. SOHO Farside Images of the Sun from SWAN and MDI. Daily Solar Flare and Sunspot Data -- from the NOAA Space Environment Center. What is an Iridium flare? See also Photographing Satellites by Brian Webb. What is an Astronomical Unit, or AU? You are visitor number 33273379 since January 2000.